While the Sherman tank is so closely associated with the Second World War, it’s sometimes overlooked that these vehicles also served the US Army in a very different conflict, the Korean War. This article from the May-June 1953 issue of ARMOR provides an account by a First Lieutenant who recounts how Sherman tank crews in Korea had to acclimate their tactics and vehicles to fighting a static war in mountainous terrain. One thing we found rather interesting in this article was the mention that one of the Easy Eight Sherman tanks was equipped with twin .50 cal machine guns on the roof and one in the hull replacing the .30 cal machine gun. A picture of the vehicle with the twin .50 cal guns is included in the article. If any other photographic evidence of this particular vehicle exists, we would love to see it. Click on the page images below to view them in full size. 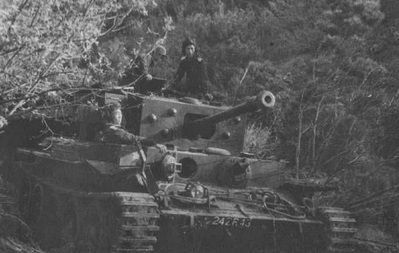 The blog “Thank you for Your Service” has posted an interesting article about captured Cromwell tanks in service with the North Korean Army during the Korean War. The article states that there has been a good deal of debate over how a handful of British Cromwell tanks ended up in the hands of the North Koreans. The answer to the question seems to be a battle in late 1950/early 1951 called “The Battle of Happy Valley” in which several Cromwell tanks were captured. The article notes that many of these Cromwell tanks were later recaptured by UN forces, and in one instance, a Cromwell was shot and destroyed by a British Centurion tank. The article also mentions a Cromwell in North Korean service that was captured by South Korean Marines during the Inchon landings. All in all, a rather interesting read accompanied with some good photos. Read the entire article at “Thank you for Your Service” blog. The website Korean War Educator hosts an impressive number of written memoirs from Korean war veterans. Several of these memoirs are from veterans that served with armored units. These are all well written and worth a read, providing interesting details on Korean War tanks as well as insights into the experiences of the men who served in these vehicles. Some of the entries also have photo galleries. We have listed the tank related entries below with links.